Join the discussion on our forums! Come discuss Augmented Elekk over in our dedicated Augmented Elekk discussion topic. Whenever you shuffle a card into a deck, shuffle in_an extra copy. Her friends call her "Shuffleupugus". Currently too powerful. 3 mana 3/4 itself is strong-ish statline and the effect can generate so much value. Pretty interesting interaction with Tracking. With Tracking, you discard three cards from the top of your deck, look at them, choose one and then the following happens: the card suffles back into your deck, to the top of it, and then you draw this card normally. 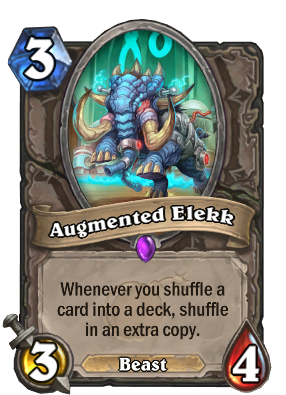 If Elekk is on the board, you shuffle the second copy of the card into your deck! This plus Golden Monkey = doubles your deck. Works great in my control warlock deck! If you Psychic Scream, does it add the copies or not? I will use this guy in my quest hunter deck, looks interesting. Works with Faldorei Strider and lab recruiter well. Minions not too understated, I can see it being played in a miracle/myra deck. shadow word death, poly, hex, execute, siphon soul, vilespine, naturalize, twisting nether, voodoo doll. There goes ur game plan. Miracle Rogue Clown Festival is Real ? do we still get strider ? Isn't it 24? Six per Augmented Elekk, twice? Queen Carnassa, Dire Frenzy, Direhorn Hatchling, Raptor Hatchling, Astral Tiger, Baleful Banker, Dead Man's Hand, Deck of Wonders, Fal'dorei Strider, Psychic Scream, Archbishop Benedictus, Elise the Trailblazer, Kingsbane, The Darkness, Academic Espionage, and Lab Recruiter are all of the standard shuffle effects. Just remember you can't have more than 60 cards in a deck. Rogue is one stop further to having Infinite Value. Great. I just disenchanted The Darkness because i thought that crappy card would never see play outside of being a tech card against highlander decks. Not a big loss though. I don't believe this will become meta breaking or maybe even participate in the new meta. It's just slightly more playable now. Do you play vs the innkeeper?